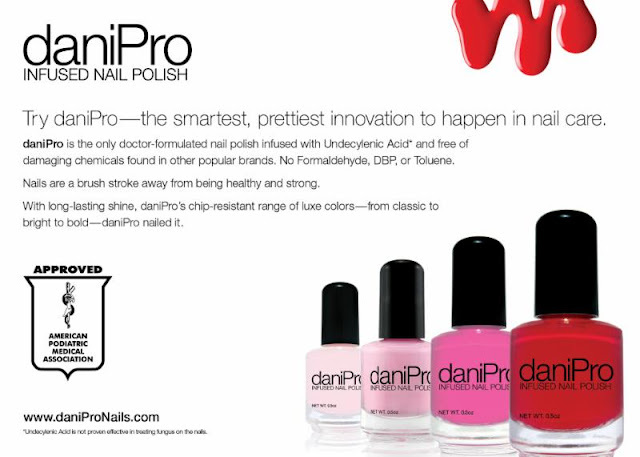 Never Enough Nails: daniPro- A Brand New 5-Free Line! daniPro- A Brand New 5-Free Line! It's Spring and that means sunnier days and sandal season are upon us. It's the perfect time to upgrade your health and beauty routine from head to toe. For many of us that means trying to eat a healthier diet, and tuning in to personal care products that have clean ingredients. Chemical-free skincare seems to be top-of-mind. But what about what's IN your nail polish? While many popular brands out there contain toxins, daniPro, is the newest doctor-created toxin-free polish free of harmful ingredients making it a Spring must-have for anyone looking to get healthier, stronger, prettier nails. daniPro polish is available globally at select podiatrist offices as well as online at www.DaniProNails.com. The website often features a rotation of the most popular patient questions, healthy nail tips from Dr. Evans as well as special seasonal offers and new product news. SRP: $18.50 (.5 oz each). Zoya Sunsets Collection Summer 2016 Swatches!! An MDW Lynnderella Friday, Vol. 44! Zoya Seashells Collection Summer 2016 Swatches!! OPI Retro Summer 2016 Preview!